One last time we woke up in the Days Hotel, leaving behind it’s simplistic hospitality for a final day in the city which never sleeps. As always, my room would wait until the last fifteen minutes to wake up, however today was different: our friend Adam was going to be leaving, and with him another seat would be left open on our bus. Ignoring this, I continued onwards, packing my bags into the excessively small elevator and throwing them onto Earle’s bus before walking over to the 96th street station. By popular demand, we rode down to 14th street to meet up with Scott Fried, the same man who spoke with us in Vegas, in the meatpacking district where he lives. This area once had been used mainly for food production; now the meatpacking district had evolved into something more, a costly place to stay and growing region in the concrete jungle. We walked past towering modern monoliths, the remnants of meats gone by, and on the remains of cattle corpse transport train tracks. 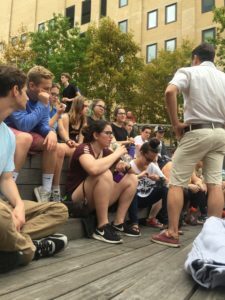 Now covered by foliage, the tracks, more commonly referred to as The Highline, have been turned into a nice walkway over the district and house multiple pieces of modern art and some beautiful views of the New York skyline. There were multiple vendors peddling art that I would call experimental pop art, of which I coaxed myself into buying two three dimensional pieces depicting Vincent Van Gogh and Andy Warhol. Seeing Scott again meant a lot, as upon our first meeting I felt a strong connection to what he personally spoke to. Having the chance to walk with him in the place he knew so well really gave him another dimension of passion beyond what I’d had seen before. Next, we would find our way to the Chelsea Market, a complex of food vendors and appealing art. With our now routine $20 for lunch and partner, I would depart with Adam into the bustling building. Built into what I can only assume was some sort of factory, stores are cramped beside one another, separated by walls built into an entirely different infrastructure, with an artsy decor overshadowing an attempted historical vibe they seemed to try and keep. After a heated debate (not really) and walking around, Adam and I decided to settle down at a margarita pizza place — one he’d been to before and loved — which I do not regret letting him choose. I would pick up two small prints from an artist by the complex’s exit: an American flag with a Wonder Woman replacing the stars and a nighttime landscape of Times Square from a friendly artist. And while the market wasn’t exactly what I expected, I now can say that I’ve seen a thirty three thousand dollar hand-blown glass banana AK-47 pipe with additional monkey attachment; yes, I know this sounds like the stupidest thing ever — who else will ever to say that sentence? Upon saying goodbye to Scott yet again with multiple hugs and the promise of kept contact, one which I intend to not break, we all went down to the subway and rode towards Canal Street: New York’s capital counterfeit paradise. As an avid hip hop listener, I already knew just what Canal Street was, and I couldn’t be anymore excited. Who wouldn’t want to buy a near indistinguishable fake Rolex for cheap? But alas my expectations were too high and instead I found almost all the same chachkis we saw in Times Square, just cheaper and mixed in with obvious knockoff materialistic products. Everyone knows it’s fake and illegal, but a blind eye is given in the chase of looking wealthier from afar then you may be. Some of us bought knockoff Louis Vuitton fannypacks, others bought more discrete poorly crafted watches — and then some just went around haggling as low as they could go. From there we would walk through Chinatown and into Little Italy, the burial place of the Jewish immigrant’s now dead community. As you go down Mulburry, the Italian flags and businesses began to emerge between the Asian establishments that dominate the inter crossing Canal Street. As the Italian and Chinese sides to the street clash for more room, the Jewish culture which decades ago was lively and apparent has become gentrified and forgotten. Only the Yiddish publication FORWARD’s tower stands as a reminder of what once was, with its Hebrew title shining high above the East Asian characters and Italian iconography. We talked about the tenements and what the Jews who entered this county had to live through to allow for the family’s future success. This analyzation of what once was for our people tied back into our question of what the American Dream truly is and who has it. From here we would say goodbye to New York and all its flashy splendor, taking the road for the next couple hours. As the day had gone by, in the back of my mind I knew this was Adam’s last day. We were going to lose another member of this family we’d made, and I was going to have to say goodbye to someone I proudly call a friend. 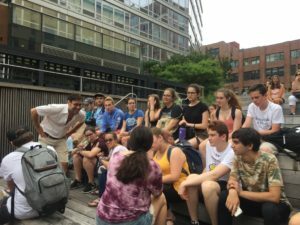 Our final pit stop would be in Providence, Rhode Island at Thayer Street and Brown campus; it was dinner and the last time Adam would spend time with us. Along with Adam, Hannah, and Daniella, we chose to eat Chinese food at a buffet style restaurant called Chinatown. Following that we walked around the streets, entering stores and joshing about, all the while reminiscing about the past few weeks and trying to ignore the obvious. And with a Ben and Jerry’s waffle cone of s’mores in one hand and a book in the other, I returned to the bus one last time before I would return to the commonwealth I call home—and that last stretch of highway before we’d have our eighth loss. Entering the Courtyard Marriott last night hit me like a bag of bricks. On one side was my father, who I hadn’t seen for weeks and couldn’t wait to talk with. But on the other stood my friend and his own father, there to take him away. 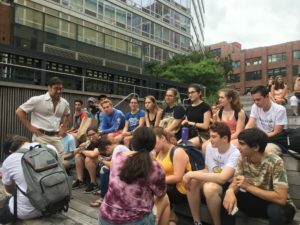 While Etgar 36’s mission statement is to help us as young adults develop our political and social consciousnesses while being exposed to things firsthand we may have never seen before, I see the relationships I’ve been able to build with my peers in such short time as what I’m most thankful for. All the memories, moments, hilarious quotes, and inspirational speakers won’t be forgotten anytime soon. Just because I’m back in Massachusetts for the next two days, it doesn’t mean that the journey is over; these next few days I just need to live in the moment and just enjoy the time I have together with my Etgar 36 family on our ever-moving home aka Earle’s bus.